Omaha: The Backwaters Press, 2011. $20. Literary Nonfiction. Essays. Native American Studies. Distributed by Small Press Distribution. 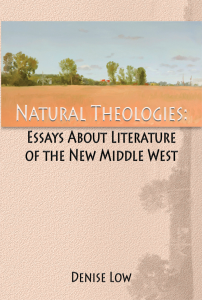 NATURAL THEOLOGIES: ESSAYS ABOUT LITERATURE OF THE NEW MIDDLE WEST is the first critical study of contemporary Mid-Plains literature. Denise Low shows how the region’s writers inherit a Frontier legacy from Indigenous and American settler communities. Myths continue to provide framework for fiction writers and poets, as well as nature and the rich community life. Not all of the region is rural. Cities like Minneapolis, Omaha, and Kansas City, have presence in the literature—but in context of the great acreage around them. This innovative book defines the region’s character while, at the same time, illuminating a panoramic past. Indigenous peoples and their philosophies add to this unique look at the Mid-continent’s literary culture. For a little Southern girl who spent her weekly allowance on Saturday matinées featuring cowboys and Indians, the book brought an abrupt change of perspective. For example, I learned that the Lakota peoples “came to represent all ‘Indian’ groups, with their eagle feather headdresses, tipis, and horses” seen on the silver screen because of a photograph someone took when at least 300 Lakota of all ages were frozen, literally, in place and figuratively in time as temperatures plunged, instantaneously preserving those killed at Wounded Knee in the last military action against Indigenous people. The feeling of “being under siege” lingers, and yet the literature of the “New Middle West” seems more apt to adapt, innovate, and follow Low’s insightful view of Poage’s work where “Sorrow can be overcome by wonder.” Yes, and oh, what wonders! The winters, the weather, the overpowering landscapes, the open-wide spaces, the city life, the jazz music, the pool halls, the artifacts, the mounds, the floodplains, the buffalo, the coyotes, and the voices represented in these page somehow blend, harmonize, or note the discordances. As the book sweeps across the past, present, peoples, and prairie, the eclectic voices are worth hearing, literature worth reading, and places worth envisioning even if we, like the pioneers and frontierspeople of yesteryear, only get to travel through—almost always on the way to someplace else.